April 2010 saw John Lewis become the first UK retailer to sell 3D tvs to the general public. The introduction of 3D tvs and 3D television broadcasts is being called the biggest thing to happen to televisions since the introduction of colour in the late 1960s. 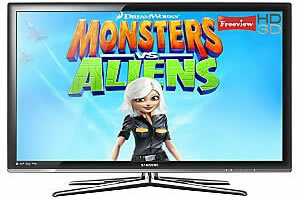 Initially only Samsung 3D tvs are available, however stocks of 3D tvs from Panasonic and Sony are expected to become available before the end of July 2010. Sky 3D is a dedicated 3D channel available now to Sky+HD customers on Sky World with the HD pack, however the channel needs to be activated by Sky before it can be viewed. The channel is currently showing some amazing 3D previews using the latest technology to create a full 3D experience in your home. Later in the year Sky 3D will be offering a range of movies, sport, documentaries, and entertainment and arts programs. Free SKY+ 3D HD box available now. It isn’t just tv programs where you can experience the full 3D effect. One of the biggest factors driving sales is games. Sony have already rolled out a free update for their Playstation 3 games console to enable 3D gaming and 3D Blu-ray functionality. Connect a compatible 3D TV to the PS3 console and with 3D games or films you will be able to watch 3D content on the screen without the need for any additional hardware upgrades. *All information on this site is reported in good faith but due to the radidly changing nature of 3D technology 3Dtvs.co.uk advise you to check the current products and terms and conditions on the retailers website or contact them direct for clarification before placing any order as as we are unable to answer any queries regarding the products that we report here as a free service.